Ever since a few shots from the trailers didn't actually appear in the final film, some fans have been hoping the DVD/Blu-ray release of Star Wars: The Force Awakens would include an extended cut with those deleted scenes edited back. Unfortunately, director JJ Abrams confirmed at his panel at the Television Critics Association, promoting his new Hulu series 11.22.63, that the DVD would not include a directors cut. Abrams said, "There will be deleted scenes, but not an extended version." 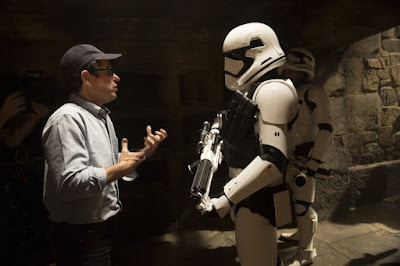 As for how long the longest cut of the film was, Abrams told reporters, "Probably, if it were with credits, close to two hours and 50 minutes was the first cut." When asked about the upcoming Rian Johnson directed Star Wars Episode VIII, which he is executive producer on, Abrams said, "It’s not my movie to talk about, but I will say that Rian’s an amazing writer and director. I’m obviously really excited about what he’s going to do." "I read that she wasn’t in the Monopoly game and was quickly making phone calls about this because if it were true — and it is true, and now Hasbro, of course, has said they’re going to put Rey in — it doesn’t quite make sense why she wouldn’t be there. She’s somewhat important in the story." Very disappointed there isn't an extended cut. Very. Disney/Lucas film are making a mistake not putting one out. They should release it in cinemas first of all, then along on blu-ray. It makes business sense, and I think the fans want it too. Yeah, and then maybe Han can stab first! The movie is so great, ... an extended cut would be great! The "deleted scenes" are necessary! Many more scenes needed to explaine some past fact! VERY disappointed also! Extremely disappointed! Not only did i want an extended version on blu-ray, I was also really hoping for an extended cut in theaters ala Avatar. C'mon JJ, please give the fans what they want! Anybody watching deleted scenes are die-hard enough to fill in the story's blanks themselves. Already preordered the blu-ray on Amazon for $20. There are many,many more .short but interesting and im a fan! !